A Genre where flesh meets metal. Where the artificial replace the natural. Where their’s no freedom other than the freedom to consume and to be consumed by Mega Corporations. The only way to survive is by living on the edge and by doing what it takes to become more than human. The following pieces all borrow from the ultimate dystopian genre. But… yet, who would’ve thought that being an oppressed cyborg could be so much fun? The character pieces below showcase how badass the Cyberpunk genre can be! 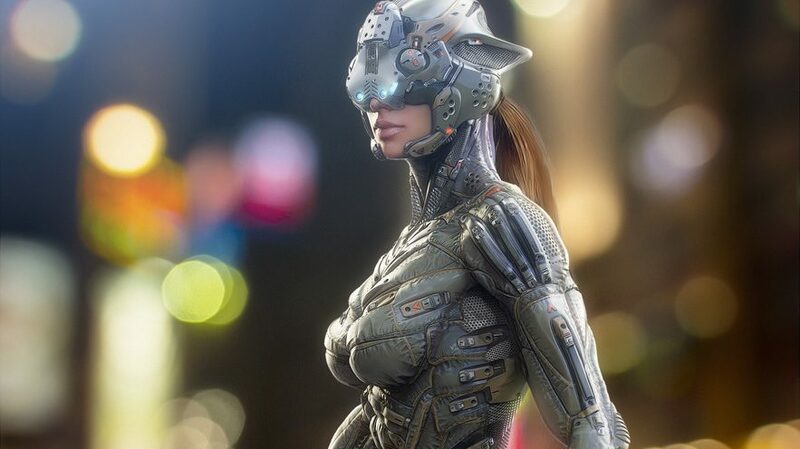 In this piece we see a tech suit merging with the skin of it’s user. A playful cat tail and cat ears break the mold of this operator-like suit. A contrast that fits the genre like a glove. The art of Angelitoon is filled with other operator-like cyborgs, so if you dig the style you should probably check it out. A cyborg wearing a very unique uniform, Jerommy2 looks like a character straight from Shadowrun or Cyberpunk 2077. The mix of hard, boxy cyborg and armor parts with cloth emanates personality. A professional with a flair for style. The shock of religious imagery, crazy hair, even wilder colors make this the short of thing the cyberpunk youth would be in. Would this be a scene kid or even a flamboyant hacker? Or maybe it’s just the avatar of someone surfing the Holo net on their Augmented Reality deck. A close up a private merc giving you the look. This soldier has seen better days. The symol on his chest shows us that he is part of a mercenary group, or something of the sort. Mixing magic with implants, this Shadowrun inspired character portrait for a friend looks colorful, unique. It goes against the doom’n’gloom grays you see in so many other character portraits. The colorful hair, the matching colors on her implants and weapons, the defiant yet cute look. This is a runner, ready to hit the mega corps where it hurts if I’ve ever saw one. Practical yet over the top. That smug look and mechanic arms tell a story on it’s on. Freedom in the Cyberpunk world comes with a cost, and this Gunsmith has already a price for you ready for pick up. Five incredible Male Fantasy portraits!